Composer-conductor Mark Camphouse is Professor of Music at George Mason University in Fairfax, Virginia, where he conducts the wind symphony and teaches courses in composition and conducting. He holds undergraduate and graduate degrees from Northwestern University. His 30 published works for wind band have received widespread critical acclaim and are performed frequently in the U.S. and abroad. 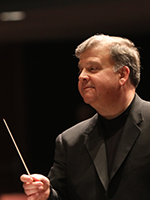 He has served as guest conductor, lecturer, and clinician in 43 states, Canada, Europe, and China. He is a recipient of the prestigious Outstanding Faculty Award by the State Council of Higher Education for Virginia – the Commonwealth’s highest honor for demonstrated excellence in teaching, research, and public service.